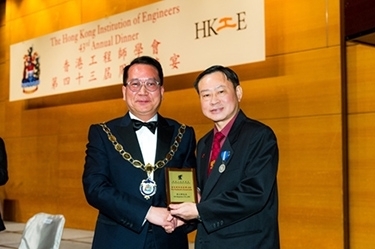 The presentation of the HKIE President's Award was made at the 43rd Annual Dinner. The President's Award has been set up by the Institution in recognition of the dedicated and valuable service of the member of any class who has served the Institution with distinctive achievements. This year, Mr Benjamin Y B Lam received the honour of the President's Award for his immerse contributions and remarkable achievements. Mr Benjamin Y B Lam obtained a BSc (Hons) in Mechanical Engineering from The University of Liverpool in 1989. Upon graduation, Mr Lam worked as a Catering Engineer in Maxims Catering Group (Maxims) providing E&M services. Since then he has been a Project Manager in innovation and technology development for Maxims. He is currently involved in the safety management for all the Group's construction sites, and in developing environmental improvements and awareness within the Group. Mr Lam joined the HKIE as an Associate Member in 1992. He has participated in the Associate Members Committee (AMC) since 1998. He has also held different positions in the AMC, Aircraft Division, Control, Automation & Instrumentation Division, Environmental Division and Information Technology Division. In Session 2000/2001, for example, he was elected AMC Chairman. During his chairmanship, he improved the status of AM in the industry. He insisted that AMs enjoy better promotion when there is a special route to Corporate Membership. Since 1999, Mr Lam has organised over 150 seminars, visits and delegations for different HKIE Divisions and Committees. He has contributed to the development of AM and participated in the three Task Force Groups on the Development of AM and the Development of the AM Scheme Training Programme. He is also a Lead Assessor and member for accreditation of the AM Scheme Training in the Building Services Discipline for AMs. Mr Lam was an Ex-officio Member, AMC of the Council, a member of the Education & Examinations Committee (E&EC), the Public Relations Committee (PRC), the Continuous Professional Development Committee (CPDC). He was nominated by the HKIE as a Committee Member of the Occupational Safety and Health Council in the Electrical and Mechanical Trade Committee. He is currently a member of the Professional Assessment Committee (PAC), the Training Committee (TC), the Accreditation Committee for Higher Diploma Programmes, and is an Ex-officio Member of the Building Services Discipline Advisory Panel (BSDAP). He is actively involved in the Technical Task Force Group on the Mandatory Implementation of the Building Energy Code of the EMSD. Mr Lam represents the HKIE as a Committee Member in the Vocational Training Council (VTC)'s Engineering Graduate Training Scheme (EGTS). He also joined the HKIE School Ambassadors Programme and gave numerous career talks to educational institutions. He has been a mentor for different high-stake mentorship programmes including the Wofoo Millennium Entrepreneurship Programme since 2009. He has been an adjudicator for the Science Students Project Competition organised by The Hong Kong Federation of Youth Groups and the Education Bureau since 2013. Mr Lam represents the HKIE as a Judge for different awards organised by different District Councils. He served as an Organising Committee member in different events organised by the government departments and the industries.